Tite has named an exciting squad for the upcoming friendly matches, although injury has deprived Vinicius Junior of a first cap. Brazil’s players have arrived in Porto as they prepare for the upcoming friendly matches against Panama and Czech Republic. Tite has named a young squad with the likes of Everton, Lucas Paqueta, Felipe Anderson given opportunities. By Tite’s cautious standards, this was an adventurous squad selection – encouraging ahead of the Copa America later this year and after some of the uninspiring friendly performances served up by the team last year. 18 year old Real Madrid forward Vinicius Junior was called up for the first time, but he will have to wait to make his debut after suffering an injury. 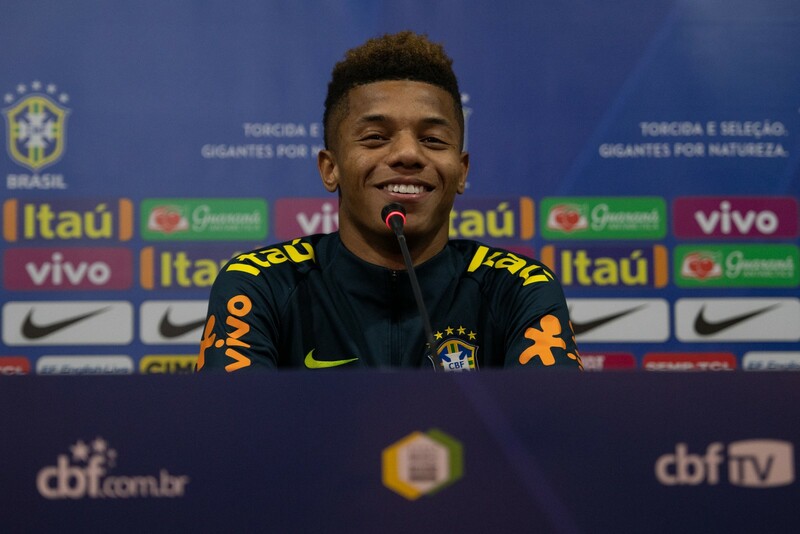 He was replaced by David Neres, whose good Champions League form for Ajax convinced Tite to give him a chance ahead of Dudu of Palmeiras. Dani Alves and Felipe Luis were called up, but have also since pulled out with injury and been replaced by Fagner and Porto’s Alex Telles. Older, and out of form players such as Marcelo, Renato Augusto, Paulinho, Willian and Douglas Costa were left out altogether, while Fernandinho would have been selected but missed out through injury. The friendly matches – against Panama, on Saturday in Porto, and the Czech Republic on Tuesday in Prague – are the final opportunity for Tite to experiment before he names his squad for the Copa America later this year. I’m hoping to see a little more entertainment, and ambition from the team, than I saw against Uruguay in a friendly at the Emirates Stadium last year. This entry was posted in Seleção by Brian Davidson. Bookmark the permalink. Has it seriously gotten to the point where Tite should consider a three centre back formation with a standard left back and more of a winger on the right. Or converting a player from another position like Piazza on the ’70 team. I swear I was thinking about whether a healthy David Luiz would be better than Fernandinho before the Belgium game. And still can’t get out of my mind how Dunga with similar ability to pass out of the back was so instrumental in putting three past Schmeichel in the ’98 quarterfinal against Denmark, a team so like Belgium. And speaking of fighting the last war, please no more Fernandinho and, since Coutinho apparently can’t crack the Barcelona starting lineup and missed the most makeable chance late vs. Courtois, how about giving another scoring threat from the top of the box a chance. We desperately need a new star. And, remember going into Qatar, the Selecao will not have won a WC final outright in over 50 years playing with two centre backs. Interesting thoughts Renato. I’m personally not a huge fan of 5 or 3 at the back. I suppose if you play that system you then want to pass and build your way out from the back which is the sort of football that Brazil likes to play. I see a few problems with it though – 1/ Brazil doesn’t have great depth at centre back, 2/ a guy like David Luiz is a nice ball player, but he isn’t a good defender (I watched Everton v Chelsea on the weekend and he didn’t move during the corner and didn’t jump for the ball – his opponent beat him, leading to Everton’s goal), 3/ where would Neymar play? His best position is attacking from wide left; if you have a wing back playing there, that would probably mean Neymar has to come inside – would that work? Tite just seems so unimaginative. The lateral defender talent seems so thin at present and the attack so weak with Neymar out and Coutinho off form that a bit of Brasilian improvisation might help. Zagallo initially selected a winger (Flavio Conceicao) as Cafu’s backup in ’98 and Scolari played a lot through Roberto Carlos in a kind of left-handed three centre back formation in ’02. Would consider anything at this point to get a dynamic player up field to enfilade the opponent. Not advocating for David Luiz going forward, but cannot understand why he was never considered as a backup for the ’18 team given his ability to play multiple positions, his passing ability, and his offensive capability on set plays and pks. Just can’t believe that Tite et al war planned a Denmark’ 98 with Casemiro unavailable and did recognize Luiz’ potential merits given his role with Chelsea two years ago, his two goals in the ’14 WC knock out rounds, and his ability to take pks.